Update: As part of a segment on Live With Kelly and Michael, I've created free PDF's of the wine tags featured in this post with 2013 Best Picture Nominees. Click here for the updated tags. 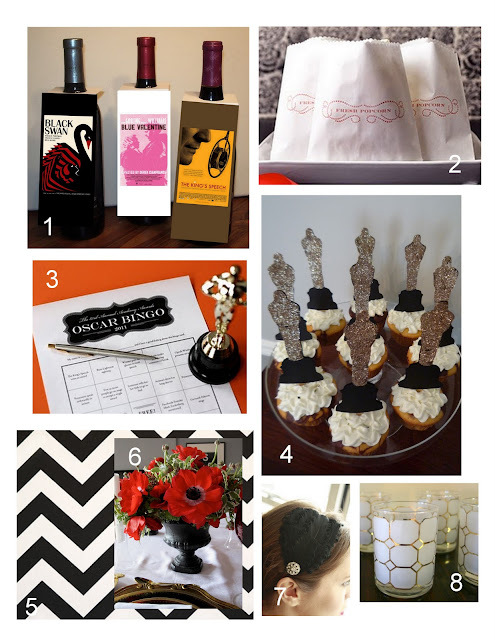 My Oscar's inspired cake toppers last week got me thinking about throwing an Oscars party. I don't know if I'll be able to pull it all together in time (the awards are on 2/27), but here's a little glimpse of what it might look like if I do. 1. Using some card stock and my printer I'd whip up wine tags with all of the nominated movies on them. These wine bottles would be for display only and would be lined up a buffet or scattered throughout the entertaining space 2. I love these very elegant popcorn bags spotted on, Amy Atlas Events. It wouldn't be an Oscar worthy party without popcorn! 3. Jessica of How About Orange created this 2011 Oscar's Bingo card which can be downloaded here. 4. My Iron Craft Challenge cupcake toppers, click here for the how-to. 5. To dress up the table I'd use a couple of yards of black and white fabric as a runner. This great chevron is a steal at $6.98 a yard on fabric.com. 6. I love the look of these flowers spotted on For the Love of Design. I have two black urns, that I am always looking for an excuse to use, filling them with red flowers would really glam up the decor. 7. Speaking of glam. I may have to channel my inner diva with some sort of accessory like this feather headband by Lily Lady Blue. 8. Lastly, this party would be the prefect excuse to buy these vintage cocktail glasses, available via Vintage Revival Living, which I would use as votives.